Creating Passionate Users: Head Rush Ajax ships! 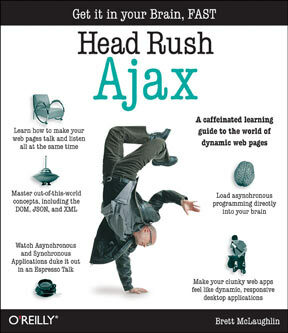 "Head Rush Ajax puts dynamic, compelling experiences within reach for every web developer." The Head First series has a lean, mean baby brother--Head Rush--and the first one just shipped. Head Rush Ajax was written by O'Reilly bestseller and uber geek Brett McLaughlin, and makes Ajax accessible and, you know, festive. Congratulations to Brett -- he pulled quite a few all-nighters in the end there to get this book out. I should mention that Brett is also now the editor/director in charge of the entire Head First / Head Rush series, and Bert and I are thrilled to have him managing our "baby." We recently did a four-day Head First authors training bootcamp, and while I'm not yet at liberty to announce the topics, there were more than a dozen authors and editors now working on titles. This has been a spectacularly difficult series format to scale, but it's starting to look like Brett just may be able to pull this off. If you're interested in the possibility of writing a book in the Head First or Head Rush series, the details of the audition process are here. Hint: it's not about the writing (my writing skills are pretty dicey--and I've authored or co-authored four of these puppies already). It's ALL about what happens between the reader's ears, and what you do to help drive and support that. Again, congratulations Brett! You did an amazing job on the Ajax book as well as defining Head Rush. Amazon shipped my copy this afternoon - sweet! I just bought my copy on Saturday. So far, it's been an excellent read. This is instructional design brilliance.